Manitoba, Canada ombudsman orders Winnipeg to release photo radar information to the public. Hidden speed camera traps are so common in Winnipeg, Canada that members of the public have taken action. An active Facebook group tracks the locations of photo radar vans, and volunteers take time out of their day to stand on the roadside holding large yellow signs to warn fellow motorists of the trap up ahead. On Monday, the Manitoba Ombudsman released her report siding with these members of the public seeking greater government transparency. 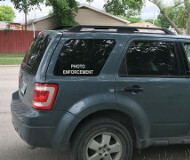 In August 2015, the group Wise Up Winnipeg used the province’s Freedom of Information and Protection of Privacy Act (FIPPA) to ask the city to turn over a list of all photo radar locations. The city refused, insisting that it did not have the locations because a private, for-profit contractor was responsible for that information. The ombudsman intervened to shoot down this excuse. “A public body cannot contract out of its responsibilities under FIPPA to provide access to records that it would ordinarily hold under its control such as, in this case, records associated with a law enforcement activity,” the ombudsman ruled. The ombudsman also noted that the city’s own contract with Xerox states that all photo radar records are to be considered city property. The city responded by releasing a handful of location records, but it withheld others, claiming the release of more would “endanger the life or safety of a law enforcement officer.” Asked to look into this matter, the ombudsman found the claim of possible danger implausible. The investigators reasoned that the speed camera vans themselves are visible and could be found by anyone taking the effort to look for them. They did not see any demonstrable increase in risk from publishing a list of locations. In response to the legally binding ruling, Winnipeg released the requested information.